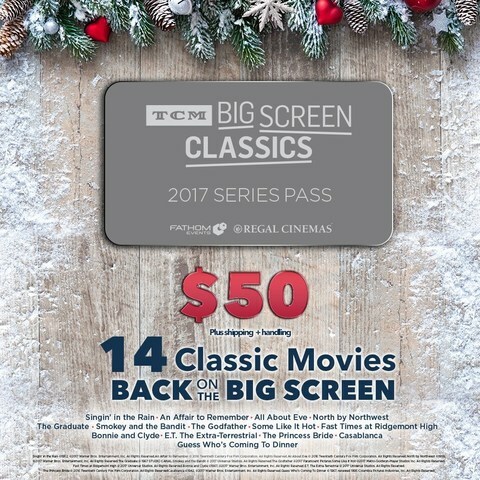 Regal Entertainment Group, a leading motion picture exhibitor owning and operating one of the largest theatre circuits in the United States, announces that our guests can purchase a TCM Big Screen Classics 2017 Series Pass as a gift for themselves or others and see all 14 classic films in the series like The Godfather and Casablanca for only $50. This special year-long series is presented by Fathom Events and Turner Classic Movies (TCM). A limited quantity of the Series Pass is available for purchase, so get one of the 1,000 being offered while supplies last. Regal Crown Club members will receive 5,000 bonus credits with their purchase. "Regal is excited to partner with Fathom Events and Turner Classic Movies on this TCM Big Screen Classics Series Pass, and offer our guests a chance to see these timeless favorites at a valuable price," Ray Nutt, Senior VP Business Relations at Regal Entertainment Group, said. "Many of these films are celebrating milestone anniversaries, and there is no better time to re-watch or catch them for the first time than in the movie theater." The 2017 TCM Big Screen Classics series begins on Jan. 15, 2017 and runs all year ending on December 13, 2017. To purchase a TCM Big Screen Classics Series Pass, please visit regmovi.es/2h4UKwl. For additional information including the participating theaters, as well as the full 2017 schedule, please visit regmovies.com/promotions/TCM-Series-Pass. Regal fans are encouraged to like Regal Cinemas' Facebook page and download the Regal Movies app. Moviegoers can program their favorite theater and purchase tickets all from their mobile device. The Regal app also gives patrons the ability to upload their Regal Crown Club card straight to their phone for easy access while on-the-go. Through the industry-leading Regal Crown Club, 13-million patrons each year accumulate credits at the box office and concession stand to earn rewards including free popcorn, soft drinks and movies. Free membership is available at the box office or online at regmovies.com/Crown-Club.